Summer is always here and for many British of the older generation, this season is akin to preserving the fresh fruits of the season. Though making homemade preserves may not be necessary today – thanks to modern processing plans – it would still be a good activity to engage in this summer. 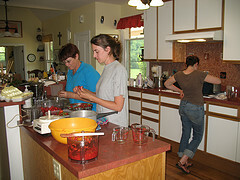 Have you ever made preserves or jam in your own kitchen? Maybe you should try out this age old tradition that our elders engaged in. Not only will you have homemade jams and jellies to consume throughout the winter months, but you’ll also have memories to last for the rest of your life. So how do you go about making jam? Helen Gaffney of The Great British Kitchen provides tips that have been tried and tested by time. Here they are for your reading (and jam-making) pleasure. 1. It is most important to have jars, saucepan or preserving pan and spoons ready and scrupulously clean before you start, so that you prevent any micro-organisms from getting into the jam. 2. Choose sound firm fruit. A mixture of ripe and rather less ripe fruits is best, unripe fruits contain more pectin and fruit acid (both needed to obtain a good set) than ripe fruit. 3. Use fruit as soon as possible after picking. Wash only if necessary. 4. Cook the fruit with or without water for 20-30 minutes prior to adding the sugar. Simmer it gently to draw out the pectin. 5. Warm the sugar before adding it to the fruit to help it dissolve quickly. 6. When you have added the sugar to the hot, softened fruit, stir it over a gentle heat until it has completely dissolved before returning the jam to the boil. 7. Boil rapidly until set, stirring from time to time to prevent sticking at the bottom. Test frequently to avoid over-cooking. There’s more from where this came from. I suggest that you visit Helen’s article and read for yourself!